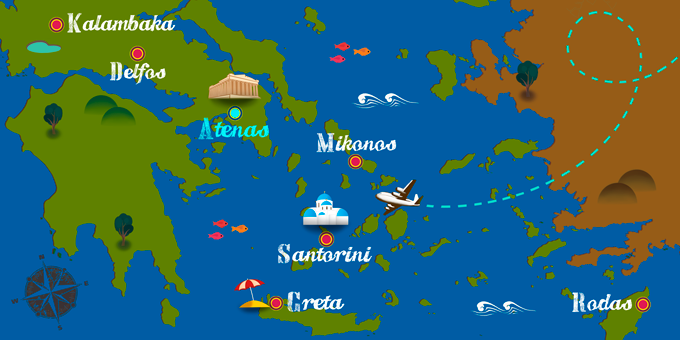 Travel to the cradle of democracy. The foundations of an ancient civilization that left us treasures such as the Acropolis of Athens, one of the most important cultural sites in the world, which remains important in the Greek capital today. Then there is Delphi, served by the Oracle in the temple dedicated to Apollo. A vacation package to Greece is not complete without the islands, the stars of the Aegean sea. Santorini, tinted in the electric blue sea. This beautiful location has inspired a number of films. Rhodes, the walled island that houses the ancient Colossus, one of the Seven Wonders of the Ancient World. Mykonos, known for the beauty of the town, its beaches and its nightlife. Not to mention Crete, the biggest of the Greek islands, with larger than life capital, Heraklion. No visa is required to enter the country for Spanish nationals. 230 V. 50 Hz. Adapter not required.